The analysis of urine sediments (Urinalysis) is a common procedure in diagnostic laboratories, and allows the identification of important diseases. This procedure is usually done by a professional, which performs a visual inspection of microscope slides containing urine, aiming to identify crystals, bacteria and other relevant elements, resulting in a laborious task. The automation of this task is of great value to medicine and related areas, raising the quality and reliability of diagnosis and reducing the time spent with these tasks. 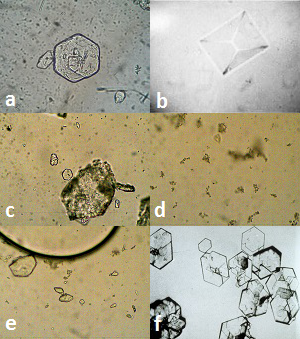 This paper describes a new method for automating the analysis of urine sediments in digital images that has the main goal of finding cystine crystals. Real images obtained from a microscope and from some public image databases were used to test the developed algorithm, which demonstrated satisfactory results with 73.72% and 93.08% of sensitivity and specificity, respectively.